Modern performance management is a practical reflection of advancements in organizational culture and management. Just like the people it’s designed to support, modern performance management never stops learning, growing, and developing. As employee expectations evolved over time, performance management underwent necessary changes as well. Command-and-control management practices gave way to an increasingly progressive and people-focused approach, with frameworks like Peter Drucker's Management by Objectives gaining popularity. Peter Drucker introduced the concept of Management by Objectives (MBO) in his 1954 book, The Practice of Management. While MBO alone is no longer considered a particularly modern or groundbreaking strategy, it established core principles on which many modern, progressive practices are based. MBO’s guiding principles focus on relieving both managers and employees from the inefficiencies of command-and-control management frameworks by bringing high-level objectives to the forefront. The MBO format challenges all project stakeholders to take an active role in setting objectives and determining their measure of success. For employees, the MBO strategy provides a glimpse into an environment geared toward employee autonomy. It places a greater focus on the purpose behind an employee's work, and endows them with a stronger voice in how that work is done. For managers, MBO shifts the focus from completing rote tasks toward achieving high-level strategic objectives. Due to their active role in setting objectives, direct reports are more committed toward achieving them. "MBO is just another tool. It is not the great cure for management inefficiency." Andrew Grove developed the OKR system as CEO of Intel in the 1970s, and described it in detail in his 1983 book, High Output Management. The OKR system was designed to focus every employee’s output as Intel made a big change from a memory company to a microprocessor company. John Doerr took the OKR system to Google in the 2000s, from which leaders spread to many other innovative companies. Objectives provide the overarching strategic targets to aim for, while key results lend a quantitative lens to evaluate the overall success of any initiatives aimed at achieving those high-level objectives. In the OKR system results are evaluated on a regular basis, most often quarterly. Each key result scores a full '1' if achieved or exceeded, or a decimal (.5 for example) if partly achieved. Objectives should be ambitious enough that scoring a "1" in the key results section is extremely rare. Routinely achieving a score of "1" would suggest that the goals being set are not ambitious enough. OKRs are often shared internally for the sake of transparency and collaboration, which is an engaging way of cascading goals from overall organization to individual contributors. This practice helps employees clarify intentions and embrace accountability in simple and direct way. Like most tools, OKRs have their own unique key benefits and challenges. An employee self-evaluation (or self-assessment) segment can help improve the traditional performance review experience by shaping it more like a two-way conversation. In an employee self-evaluation, employees are encouraged to identify areas of professional growth and highlight the contributions they find most meaningful to their organization. This structure reduces reliance on the manager's ability to account for all of an employee's myriad contributions, but it is limited by an employee's ability to intuit which of their contributions are inherently the most valuable. What recent accomplishments are you most proud of? How has your job changed since the last time we met? While adding a self-assessment segment to your performance management process won't modernize it alone, giving employees a voice in the conversation is a meaningful step toward a more mutually beneficial and sustainable practice. Poor performers often struggle to gauge their own effectiveness. Traditionally, 360-degree feedback (also referred to as the multi-rater system) was used to determine how senior leaders were perceived when there was a concern, or if they were being considered for promotion. As with many private sector practices, multi-rater feedback was originally developed for military use. This system was adopted by Esso in the 1950s to address rater bias, and reached popularity in corporate America by the 1990s, remaining in some capacity at about half of companies today. 360 degree feedback can offer all parties more information—from more diverse and trusted sources—to help with awareness and growth. In addition to supervisor assessments, 360-degree reviews collect feedback from varied perspectives of other superiors and other stakeholders including peers, subordinates, customers, and often a self-assessment segment. While it may seem like a complex operation to manage, there are several purpose-built software tools designed to make 360 degree reviews much easier to administer. Organizations both large and small have successfully adopted 360 degree feedback systems. Netflix famously replaced their annual performance reviews with informal 360-degree reviews on what colleagues should stop, start, or continue. For 360 degree feedback to work best for all parties, it's crucial that steps toward progress or resolution are made following the review. Regular manager-employee one-on-one meetings may not seem especially modern, but traditional practices tend to underutilize them. When managers meet weekly with their direct reports, they can provide timely, thoughtful feedback in an informal way that emphasizes learning and improvement. Managers who are are skilled at coaching are able to use this format to establish a dialogue with their team that builds mutual understanding, trust, and ownership of objectives. Regular coaching allows for more flexible goals and more support with stretch goals, which provides employees more of the autonomy and mastery they need to be engaged high-performers. Regularly-scheduled 1:1 meetings are an effective way to maintain a stronger, more positive relationship between manager and employee while strengthening goal alignment. Continuous feedback helps to highlight valuable contributions in the moment and provides the information employees require to course correct early on when necessary. Given that crucial information and the tools they need to improve, employees receiving continuous feedback are less likely to be blindsided by poor ratings months later during their performance review. While providing regular feedback isn't challenging in itself, the greatest obstacle is bandwidth. It's not always realistic to expect managers to provide meaningful feedback for every employee contribution personally. At best, this structure leads to an overburdened manager with too little time to manage their own priorities, and at worst, this leads to employee contributions going unrecognized. It can be both simpler and more efficient to dedicate the same bandwidth toward providing an environment where employees are able to receive that level of feedback from multiple channels. Supplementing managerial feedback with frequent and timely feedback from other sources provides all parties with more comprehensive information they can act on immediately, while limiting the cognitive load required of managers. An employee's peers are an excellent channel for timely, authentic feedback because they often work closely with one another and are more directly impacted by the work being done. To make this approach sustainable, managers and peers need the tools and culture that support continuous, crowdsourced, concrete vignettes of what worked and what didn’t. Providing an environment that promotes timely, actionable feedback on a continuous basis can help turn performance management from something both employees and managers dread into something all parties genuinely look forward to. Incongruent with many command-and-control management styles. Congratulations! You're now familiar with the benefits and challenges of both traditional and modern performance management strategies. Now let's put it all together and work toward the future! 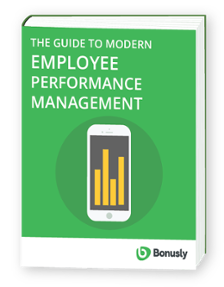 In the next chapter, we'll cover some easy ways you can implement these insights and strategies in your own modern employee performance management program. “Management by objectives … refers to a system in which overall objectives are clearly stated and agreed upon, and which gives people the flexibility to work toward those goals in ways they determine best for their own areas of responsibility." "If you talk simply and honestly about performance on a regular basis, you can get good results—probably better ones than a company that grades everyone on a five-point scale."